Do you remember the fruit smoothie place, Crush on East Main St? While they seemed to have had a good idea with their cleverly named smoothies, the place ultimately didn’t attract enough of a clientele to keep themselves open (it also may not have helped to have incense burning while cooking – why mask the smell of delicious food?). This area of Shockoe Bottom is growing exponentially if you’re looking at the sheer number of residential dwellings for rent, but there’s a significant lack of parking that could be hurting the local economy. Let’s not forget that the Farmer’s Market is still not complete so the incentive for new businesses in the area must be about looking at the future potential opportunities and not necessarily immediate gain. 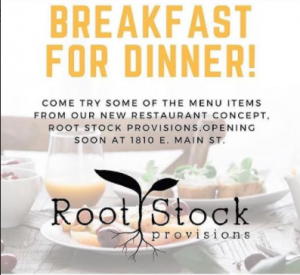 Despite it all, Station 2 recently hosted a new concept for a restaurant called Root Stock Provisions, which to turn it full circle, is opening soon at 1810 E Main St. While we missed the Station 2 event, we wonder, did any of you go? If so what’d u think? It looks like a breakfast place which is sorely missed since losing River City Diner and The Luncheonette. If these places are meant to serve the exploding number of folks down there, parking wouldn’t seem to be an issue. If their ambition is broader, parking isn’t any worse than for Sub Rosa, Proper Pie, or WPA who all seem to do fine to say nothing of Whisk who is flourishing. Just a friendly reminder to the new moderators to moderate and not straight up delete. I take living and working in this neighborhood seriously. My opinion matters as much as anyone else, and have never overstepped the boundaries of this blog. Brett, thanks for the feedback. We have been cleaning up certain things in the back end from John’s admin days. Recently, we had multiple duplicate comments and perhaps in my hazy jet lagged stupor I must have deleted your first comment. All that being said, we reserve the right to delete any comment at anytime. This is both to weed out the automated spam comments that keep trying to slip through and to ensure that the comments follow the site Use Policy.